Higher education administrator, retired military officer, amateur coder, runner, blogger, consultant and sci-fi fan. Listen to my new podcast! Click the Pixel Power Podcast logo below to learn more. Filed under apple on March 16, 2014. In a recent post I wrote about my purchase of the New Trent Airbender 2.0 for my iPad Air. Inside the case box, I noticed a small post card with the banner, BECOME A PILOT USER. New Trent Pilot Users are beta testers that agree to review products. Pilot users have to first apply and share a past review. I shared my previous post. Much to my surprise, I was selected and had a chance to choose another product to review. I chose the New Trent Gladius Air and you can check out my bullet review below to find out what I thought about this product. I was quite happy with previous New Trent product I actually purchased. Will I be happy with this free one? 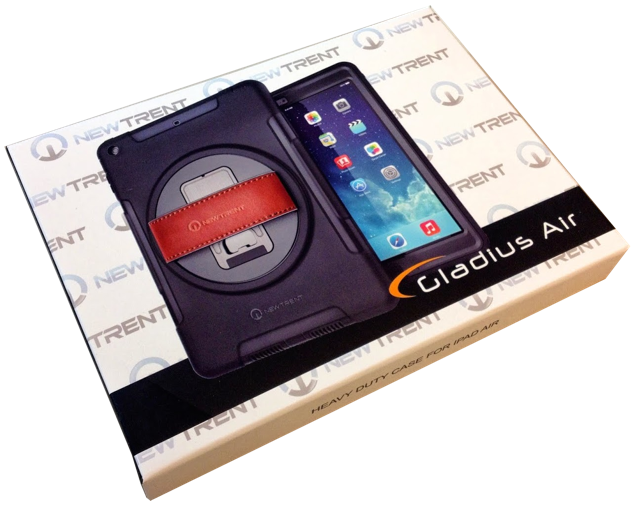 I would not hesitate at all taking my iPad Air to the beach, camping, or any other natural environment when protected by the New Trent Gladius Air. This case is also perfect for manufacturing or medical environments. While I thought the New Trent Airbender 2.0 afforded my iPad Air protection, it pales in comparison to this case. Recommended purchase if you need a ruggedized case. That’s two in a row for New Trent. I am becoming a huge fan of their low cost and high quality products. Check out the gallery below for pics and even more tips.